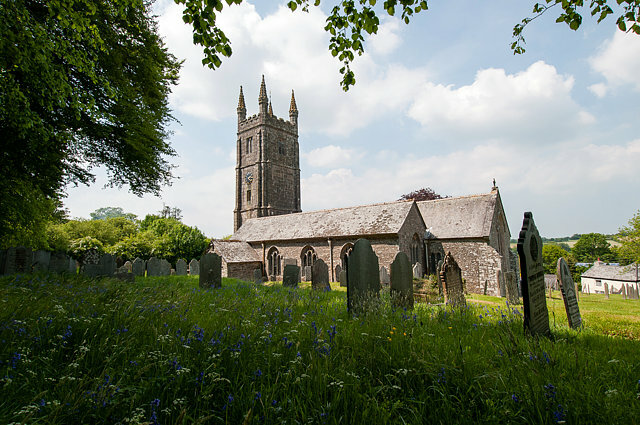 Yesterday I photographed two more churches (Lezant and Lawhitton) in my ongoing project to record all of the churches in Cornwall. 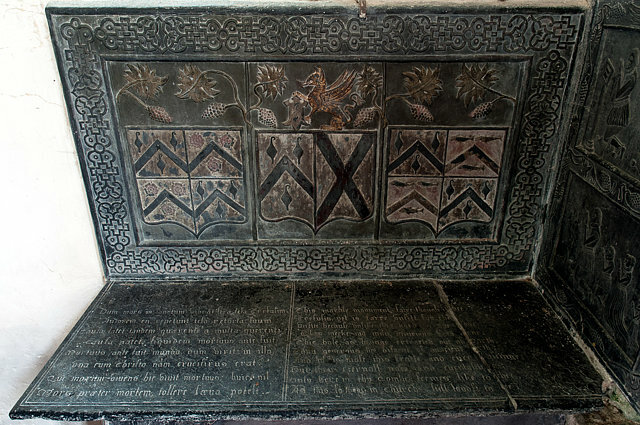 Inside Lezant was an amazing slate tomb and monument to the Trefusis family. 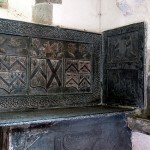 The memorial is made up of a chest with backplate and end wall panel. 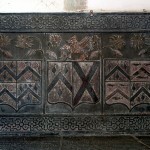 Carved in relief on the backplate, inside a border of strapwork, are three shields. 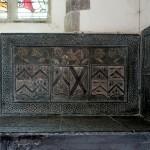 The first shield displays the arms of Trefusis quartered with Tresithney; the centre shield shows the crest and arms of Trefusis impaling Coryton; and on the third shield the arms of Trefusis quartering Milliton. 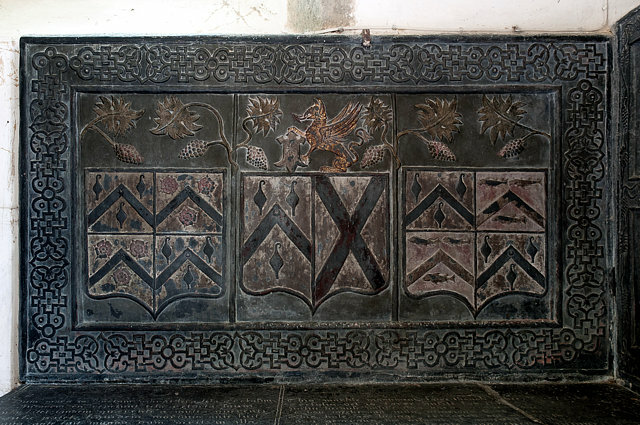 Some slight traces of colour remain to show how the tomb might have originally looked..
At a right-angle against the south wall is a panel divided into two parts by a border showing an angel’s head and a pattern of a trailing vine. 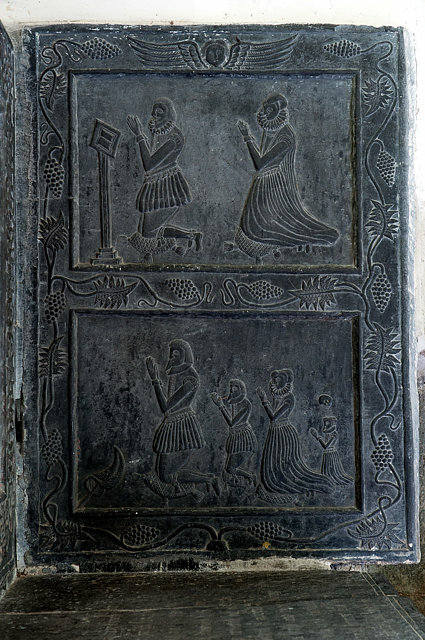 In the top half is the figure of Thomas Trefusis kneeling on a cushion before a prayer pedestal with an open book on it. He wears a ruff with his doublet and hose, while behind him his wife kneels wearing traditional gown and headdress. 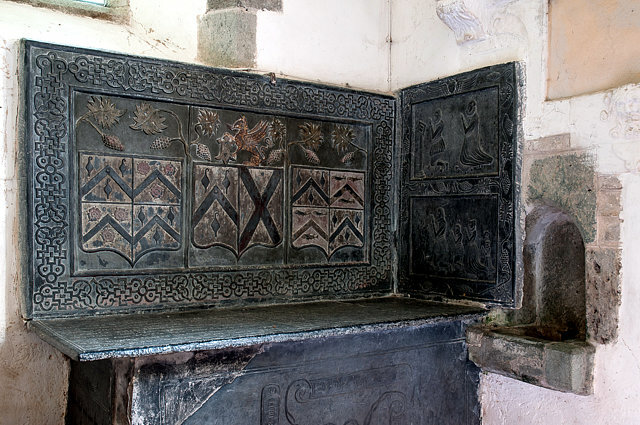 In the lower half of the panel are carved the kneeling figures of two sons and two daughters, the second daughter already deceased, as shown by a small skull. 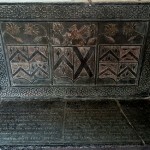 On the top panel of the chest, which is badly cracked and worn, are two verses, one of them in Latin. 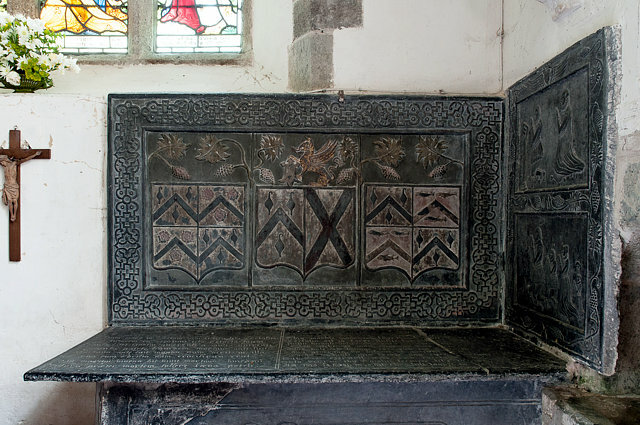 The front panel is decorated with a design of four scrolls each with a Latin phrase. 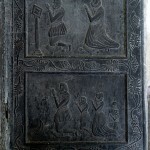 The end panel has a verse and simple incised pattern. But thou eternal now and everlastinge. 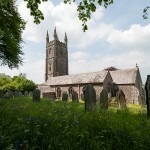 Only herein this tomb seems like to thee. As this, so thou in Church still lovest to bee. shall alter or determine his estate. This entry was posted on Friday, June 7th, 2013 at 6:59 pm and is filed under Photography. You can follow any responses to this entry through the RSS 2.0 feed. Both comments and pings are currently closed.